A 'beater' car is an older car that has seen better days which can be bought for cheap. The beater is the car you buy if you can't afford anything else. Personally I don't think that a beater is the ideal car financially since they are usually so old that maintenance and repair costs tend to be a frequent problem. There is a lot more to car costs than simply the purchase price. I think you're usually going to be better off buying a car in the $5,000 range which still has some good years in it than buying a sub $2000 vehicle that may very well face a >$1,000 repair bill at any time. If you drive a fair amount then you also have to consider cost of gas in the equation as well as many beaters aren't the most fuel efficient. If you don't have $5,000 cash then you can usually finance the car purchase for a relatively reasonable interest rate and the pay down the loan as soon as you have more cash to do so. 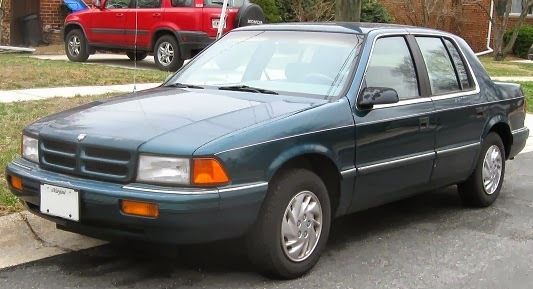 1995 Dodge Spirit. Your next car? When would you buy a beater? The situation then when you might want to buy a beater is if you don't have more cash available to buy a more reliable car and you can't obtain reasonable financing rates to finance a better car. Another possible scenario is if you are good at repairing cars and can handle repairs and maintenance yourself for little out of pocket costs. As a special case version of the beater, there is also the rare situation of what I would call the 'disposable car'. This is a car that is very cheap say in the $500 to $1000 ballpark yet still at least runs. For a car that cheap it really doesn't matter too much if it breaks down since your losses are minimal. You can always junk the car at a salvage yard for $100 to $300 depending on the car and local market. So worst case you're running the risk of losing $200-400 total which isn't much more than a common repair bill on any other used car. I would really only consider a disposable car if and only if I found one dirt cheap. The car would have to be around $500 or so to make it worth considering. If you start paying more than $500 and get > $1000 range then you should do better job to filter and find a more reliable model. Only at the very cheapest level is any functional car worth a gamble. What to look for in a beater. There are four main considerations in car features that I'd look for. You want to get a good balance of low mileage, a good reliable brand/model, good fuel efficiency and preferably a newer car rather than something older. You'll probably be looking at a trade off or balancing act between these four features. You're not going to find a new, low mileage, good MPG and high reliability brand car for cheap. But you might find a lowish mileage, poor MPG, decent reliability brand car thats 15 years old or a high mileage, decent MPG, fair reliability brand car that is 10 years old. The trick will be to look at all these factors and find a decent balance that will hopefully give you low chances of major repair bills and reasonable expectation the car will continue to run all while not killing you at the gas pump. You'll need to find a car that will meet your needs. As far as basic needs I"m talking whether or not the car has enough passenger or cargo space to do what you need it to do. This is really only a factor if you've got a larger family and need to haul a lot of people or if you do any work that requires a pickup or van to haul cargo. Otherwise most of us can meet our basic needs with any car that runs. We're talking about a 'beater' here folks. Your priority isn't to get a car with a 6 disc CD changer or leather seats and a moonroof. The priority should be getting a car that has reasonable reliability and decent gasoline mileage. Any luxury features that the car might have should be considered lucky bonus. If you can't afford more than a beater then you are not in a position to be picky about luxury features. Some cars will be described as being a 'mechanics special' or 'needing some care' or other euphemisms for a car that is broken down and in need of repair. Unless you're a car mechanic looking for a project, cross those cars out. Other cars to avoid are ones with major problems in their CarFax history like salvage titles or major accidents. Generally speaking the lower the miles on a cars odometer the less likely it is to have a major break down. Of course cheap cars are almost always going to have high miles and thats kind of unavoidable. For a $2,000 or lower beater you should not expect to see cars with 100,000 miles or more. Your first filter for a good beater is to look for one with lower miles. Shoot for a car with under 150,000 miles if you can find it or at least under 200,000. The cost of gas can be a big factor in a cars ongoing expense. If you have a choice you should look for a more fuel efficient car. This matters more if you drive more and matters less if you drive minimally. You can find the MPG rating for older cars by looking them up at fueleconomy.gov and then calculate your expected gasoline costs by using your own annual driving amount and a rough estimate of gasoline prices. For example I found an older Ford SUV that looks pretty good for about $1,900 with only 110,000 miles and it even has leather seats! However that car gets 14/17 MPG. If I drive a 50/50 mix of 12,000 miles a year then that means I'll be using 6000 city miles and 6000 highway miles. My gas usage would be 6000/14 + 6000/17 = 781 gallons. At a rough guess cost of $3.75 per gallon I'm paying about $2,930 a year in gas for that car. On the other hand there is a 1998 Dodge Neon for about $2,000 with around 150,000 miles. That Neon gets 21/30 MPG. With the same 50/50 mix of 12k miles a year that would be 6000/21 + 6000/30 = 485 gallons x $3.75 = $1,821 per year in gasoline. Comparing the Ford SUV with the Neon I'd be spending about $1,000 more each year for gas with that SUV. Thats a pretty big deal. That SUV might look a little nicer if you don't consider the MPG ratings but its not $1,000 per year nicer. First you should look for a car brand that has a reputation for high reliability. If you can find a Toyota or Honda with lowish miles in the sub-$2,000 range then I'd snap it up. But in my local search I found a grand total of one Toyota or Honda car under $2,000. These makes have a reputation for good reliability and people are willing to pay a premium for that so there aren't many for sale for cheap. If you can't find a Toyota or Honda then open the options to look at other brands and take the age and mileage into account. For individual cars look up the make and model in question on sties like Edmunds.com and see what their reliability history is like. If you start at Edmunds used car area then you can look under the brand of car and find the make/year car in question. When you have the right car and year then look for the reliability information. Again comparing the Ford SUV with that Dodge Neon. On Edmunds I find that the ford SUV has a few 'moderate problems' and one 'significant problem' but none of them are major failures and all have repair costs in the $250 range or less. The overall reliability rating is 3 of 5 stars. The Dodge Neon has a history of head gasket failures which can several hundred dollars to fix but its overall rating is 4 of 5 stars. Personally I'd say that the Ford wins that comparison since while it has more problems and a lower overall rating the risk of a major failure like a blown head gasket with the Neon is a bigger worry in a beater. You might find a bargain price on an older European car like a Saab or Volvo or even a Japanese luxury brand like a Lexus with high very miles. However I'd be careful with premium brands and European cars as I understand they tend to have a lot higher maintenance and repair bills. Newer cars are better. The big reason for this is that as time progresses the car makers get better and better at building reliable cars. This is true for all car makers and not just the most reliable models. I'd take a 2013 car over a 1983 car any day regardless of the make. The difference of a few years won't over ride the difference between the most reliable brands and the least reliable, but the difference of decades can do so. For example according to an old press report using the JD Power Vehicle Dependability Study back on 1996 the top brand was Lexus with 217 problems per 100 (PP100) reported. But compared to the latest JD power report for 2013 the industry average was just 126 PP100 and in fact all but one brand had better results than the 1996 Lexus 217 PP100. So the very best brand from 17 years ago would now be far below average compared to todays new cars. Todays least reliable brands are more reliable than the most reliable models from 20 years ago. 2. Skim the descriptions and ignore any cars that are 'fixer uppers' or have major body damage. 3. Sort the cars from lowest to most miles and keep the 10 cars with the lowest mileage. 6. Sort the cars from newest to oldest based on model year. This will probably result in 1990's cars. 7. Look at the newest car and review its reliability rating in Edmunds.com and cross off any cars that have major known problems (major engine failure, transmission failure, etc) in their reliability history. Repeat this till you have at least 3 cars that don't have a history of major problems. 9. Call up the seller for the car that you prefer the most and ask if you can check it out and do a test drive. You might need to repeat steps and loosen up requirements if you end up with no cars that fit. As a test I used this method with a quick search in my local market and ended up with a 1995 Dodge Spirit, a 1999 Ford Windstar and a 1989 Cadillac Eldorado. They have similar mileage, about $2000 and no major reliability problems that I could find. The Dodge has a bit better gas mileage averaging combined 22 MPG while the Ford and Cadillac are 17 / 18 MPG. That would be about $500 a year lower gasoline costs for the Dodge. The Ford is newer but the difference isn't huge and the higher gas costs don't warrant it. I'd put the Dodge on the top of my list.